Funds managed by Insular Life, the first and largest Filipino-owned insurance company, came out strong from last year’s roller-coaster ride for Philippine stocks, rewarding its investors with “very decent returns”. “The peso funds outperformed the market in general,” said Vera Morales, Insular’s head of Investment Management Division. From its starting level of 6,952, the Philippine Stock Exchange index dropped by almost 12.5 percent in its first month. It climbed 33 per cent to a high of 8,100, only to fall once again and end the year at 6,840, for a negative performance of 1.6 percent for 2016. 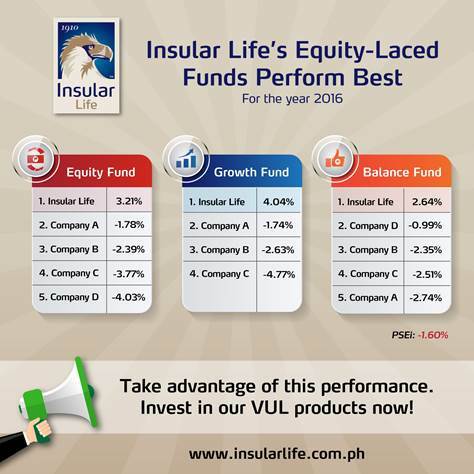 “Through it all, most investors of Insular Life’s Variable Unit Linked funds held on and were rewarded by very decent returns,” said Morales. Among these funds, the Growth Fund posted the highest return at 4.04 percent, followed by the Equity Fund at 3.21 percent. The Balanced Fund, a mixed exposure of equity and fixed income assets also delivered a respectable return of 2.64 percent. Insular Life’s Variable Unit Linked products provide financial risk protection while funding family expenses as education, retirement, and estate planning. “The commendable performance of these funds benefits policyholders of Insular Life’s Wealth Builder, Variable Returns Asset, Wealth Protect, Wealth Assure and Wealth Secure, including its packages of Wealth Secure Education, Wealth Secure Prime, Wealth Secure Retirement, Wealth Assure Education and Wealth Assure Retirement,” said Morales. Wealth Builder and Variable Returns Asset are single premium payment products. The return these give depends on the growth of the chosen fund elected by the policyholder. Part of the investment amount covers for the insurance protection embedded in the product so that if anything happens to the insured, the beneficiaries will get 125 percent of the premium or the fund value, whichever is higher. Wealth Protect, Wealth Secure and Wealth Assure, together with its packages, meanwhile, are regular pay peso-denominated, investment linked insurance products. Similar to their single pay counterparts, yields depend on the chosen fund elected by the policyholder.